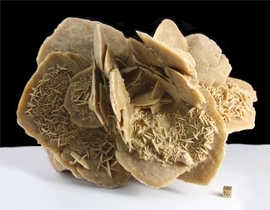 This premium giant barite rose cluster is from Canada. It makes a spectacular display piece and has not acquired any large nicks. It has been in our collection for years and was obtained from a science museum, in Canada. Desert roses are mineral formations that are found on the surface and are beautiful examples of the natural power of the shaping forces of wind, water and pressure in dry, arid regions. These natural rosette formations are minerals composed of gypsum and barite with sand inclusions. There are multiple plates that adjoin at various angles which lend to the likeness of a rose and look like flowers that have turned to stone. The so-called petals of the desert rose are flattened crystals that have fanned open along characteristic gypsum cleavage planes. The rosette crystal habit tends to occur when the crystals form in arid sandy conditions, such as an evaporate shallow salt basin. Shipped with information about the specimen and tag. Photo cube not included. A magnificent collector's piece for the giant mineral collector enthusiast!